From the Department of Neurology (T.R., J.S.B., K.H.S., G.D., D.B., R.B., F.L. ), Department of Rheumatology (R.Z. ), and Neuroimmunology, Institute of Clinical Chemistry (F.L. ), Division of Neurological Pain Research and Therapy (R.B. ), University Hospital of Schleswig-Holstein, Kiel, Germany; Department of Neurology (T.R. ), University of Florida, Gainesville, FL; and Institute of Neuropathology (I.M., W.B. ), University Hospital Göttingen, Germany. 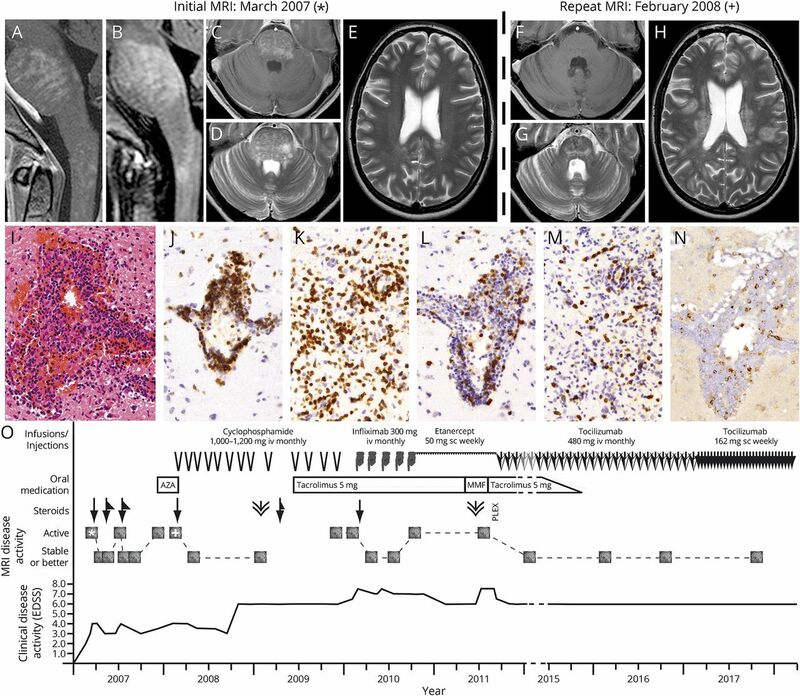 (A–E) Initial MRI 3/2007 showing typical “salt-and-pepper” like appearance of the pons and cervical myelon in gadolinium-enhanced T1-weighted (A) and fluid-attenuated inverse recovery (FLAIR)-weighted (B) sagittal sections as well as in gadolinium-enhanced T1-weighted (C) and T2-weighted (D) axial sections. Axial T2-weighted section does not show significant supratentorial involvement at the onset of the disease (E). (F–H) MRI 2/2008, gadolinium-enhanced T1-weighted (F) and T2-weighted (G) sections in the course of the disease. Axial T2-weighted section shows emerging supratentorial lesion burden in the course of the disease (H). (I–N): Histology and immunohistochemistry of the right temporal brain biopsy, 20x magnification. The HE stain shows a perivascular/vascular inflammatory infiltrate (I), consisting of numerous T cells. Also, a parenchymal T-cell infiltrate is evident (CD3 stains, J, K). The minority of T cells are CD8-positive (CD8 stains, L, M), suggesting a CD4 predominance. Single cells stain for the marker Granzyme B (N) indicating cytotoxic T cells or natural killer cells. (O): Schematic course of treatment and disease activity. Infusions/injections: arrowheads: cyclophosphamide IV; hand symbols: infliximab IV; saw tooth pattern: etanercept SC; large arrows: tocilizumab IV; small arrows: tocilizumab SC. Oral medications are indicated in square boxes, MMF = Mycophenolate mophetil; AZA = azathioprine. Steroids: Arrows indicate methylprednisolone IV 3-5× 1000 mg. Triangles next to the arrows indicate oral tapering regimes. Double arrowheads indicate intrathecal crystalloid steroid injections. PLEX: Plasma exchange. MRI disease activity is indicated qualitatively as active (upper MRI symbols) or stable disease (lower MRI symbols). Clinical disease progression is displayed as Extended Disability Status Scale (EDSS) scores in the lower section of the graph. * and + symbols indicate the point of time of the 2 MRI scans demonstrated in A-H.